If your bathroom is losing its luster, check out these beautiful design ideas for master baths, guest bathrooms, and powder rooms. You might find some inspiration for your own home. 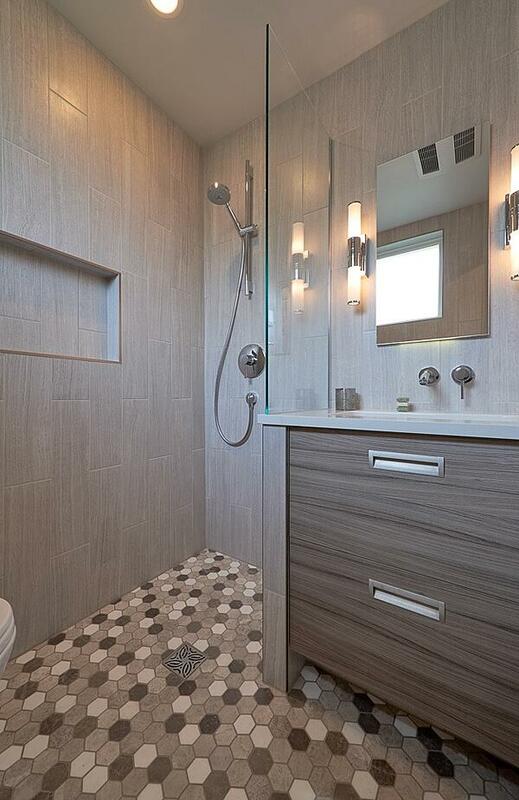 The gorgeous glass shower enclosure in this Queen Anne master bathroom seems to disappear into thin air. The seamless appearance is made possible by wood-grain porcelain tile laid in a parquet style, with no lip or shower pan. An infinity drain along the back wall completes the look. This Seattle guest bathroom offers a perfectly pleasing blend of patterns, colors, and textures. The accent walls are painted in Benjamin Moore's Mysterious hue. The Neocim porcelain tile flooring adds a playful pattern, in the style of classic encaustic cement tile but in a more durable format. The wood vanity adds warmth and texture, pulling this gorgeous bathroom together. This fabulous powder room features designer wallpaper from Schumacher in the Queen of Spain design. But the most fun feature is the hidden jib door that blends into the surrounding wall. Popular in the Victorian era, camouflaged doors are making a comeback, and this one is brought up to date by being set into crisp white shiplap. 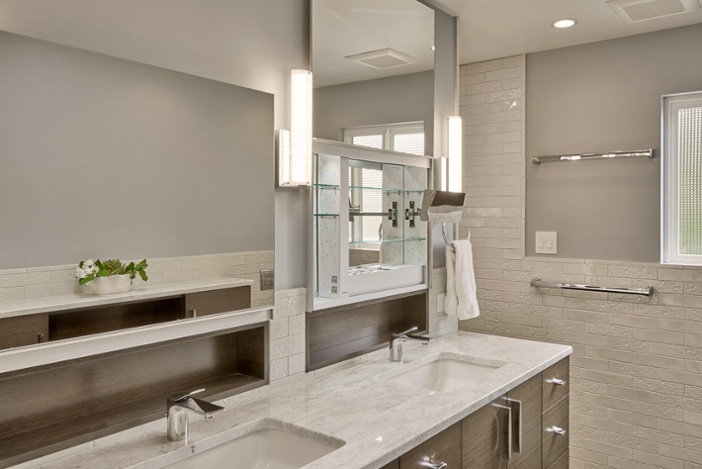 This gorgeous Mercer Island master bath features sleek Robern Uplift medicine cabinets. The mirrors open vertically, revealing adjustable shelves with interior illumination, power outlets, and a magnifying mirror. The back panel also has a mirror, so you can see your reflection even when the cabinet is open. 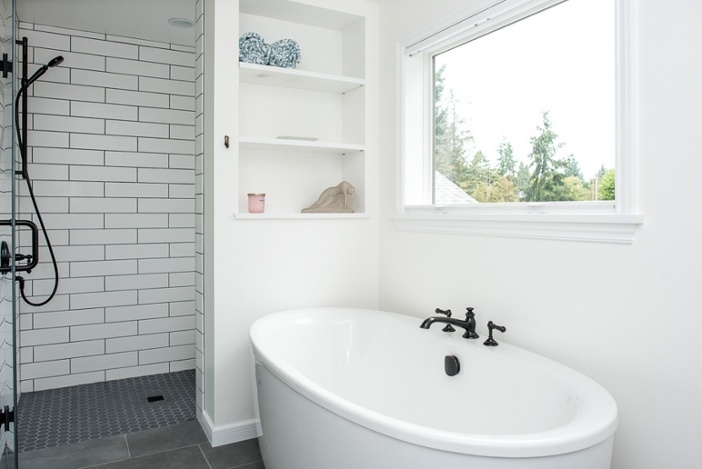 While many of our Seattle clients are opting to replace their tub-shower combos with walk-in showers, there's nothing that matches the luxury of a steamy bath. If you have the space, consider adding a separate soaking tub. It's an old idea that's making a big comeback. When designing a finished basement, a question that comes up frequently for our clients is where to put the washer and dryer. Combining your laundry room with a basement bathroom or half bath makes perfect sense and is a smart use of space. If you are trying to get the most out of a bathroom with a very small footprint, a European-style wet bathroom may be the perfect solution. These bathrooms are completely waterproofed, so the shower, sink, and toilet areas can be closer together. Why not pamper yourself with a luxurious spa-like environment? 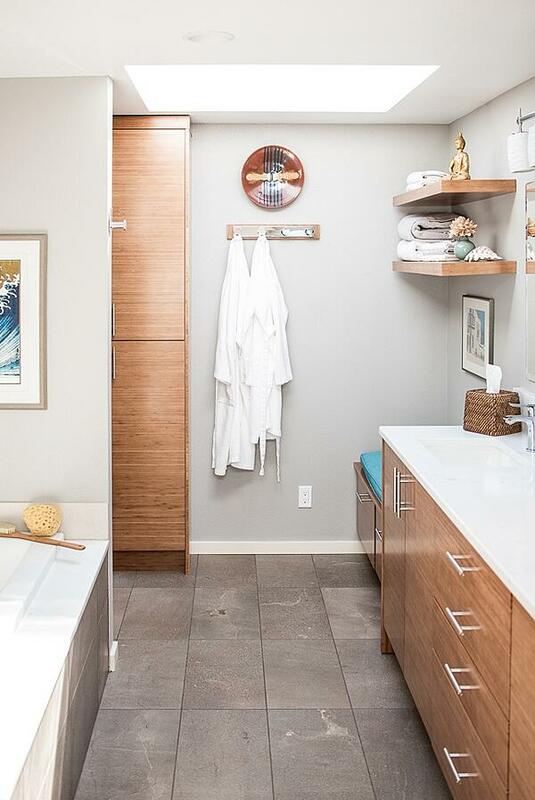 This Edmonds master bath features calming bamboo cabinetry, a lovely soaking tub, and a shower that overlooks the Puget Sound. Be sure to plan for plenty of natural light, adding a generous skylight if needed. This bathroom in a Queen Anne backyard cottage features a pane of frosted, tempered glass that provides a bit of privacy from the sink area. It's a nice touch and a great alternative when there is not enough space for a full water closet. 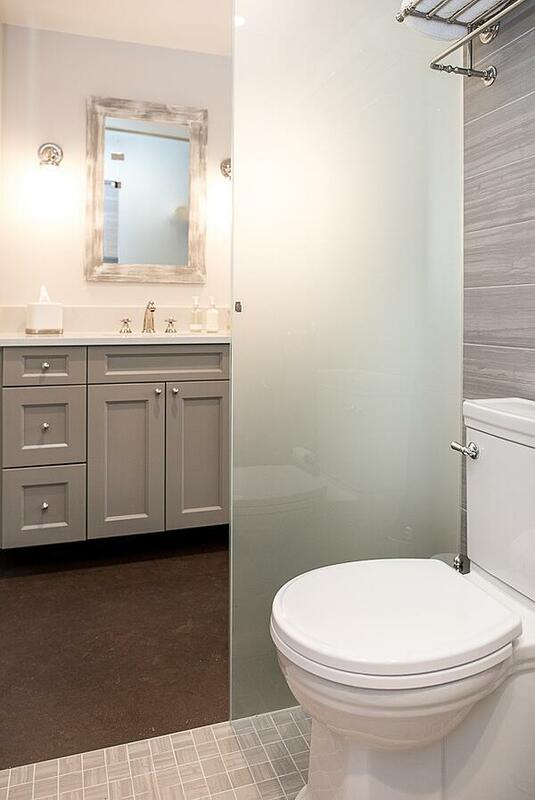 This Capitol Hill bathroom features a floating, double-sink vanity. Wall-mounted vanities help smaller bathrooms feel more spacious and open. The under-cabinet lighting in this example enhances the effect. There's more to creating a bathroom that you will love for years to come than durable buildings materials. Thoughtful design also plays a huge role in your long-term satisfaction. 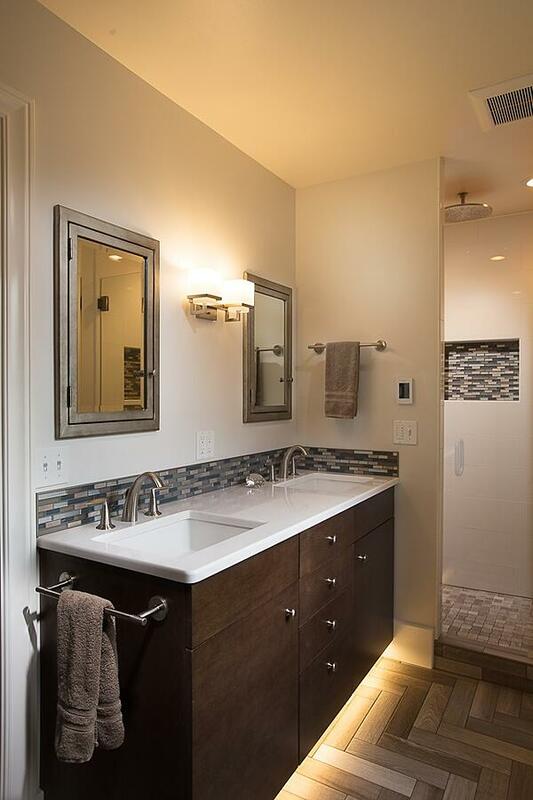 If you are contemplating a Seattle bathroom remodel, please feel free to reach out. My interior designer colleagues and I would be happy to answer your questions and share our ideas.